When one puts one’s heart and soul into what one desires to achieve, it is not merely the end result that ought to be celebrated but the journey, as a whole, that needs to be cherished. The IAYP Award Ceremony took place on 8th March, 2019 at the Lawrence School, Lovedale, Ooty, marking a moment of pride in IAYP’s work and goals. The charm of the event was enhanced by the presence of Ms. Sue Walker, Asia Pacific’s Regional Director of the Duke of Edinburgh’s International Award. The team from NAA comprised Mr. Kapil Bhalla, the National Director, and Mr. Bivujit Mukhoty, the Programme Manager. Among the other guests were Mr. K Prabhakaran Nair, Headmaster, Lawrence School, Lovedale, Mr. N. Rajan, Deputy Headmaster, Lawrence School, Lovedale, Col. (Rtd.) Sudhakar Babu Thota, Bursar, Lawrence School, Lovedale, Ms. Deborah Waller, Principal, Hebron School, Mr. Gary Everett, Principal, The Laidlaw Memorial School & Junior College, and the Award Leaders of Hebron School. We are grateful to Mr. S.S. Sorna Kumar, The Vikasa School, Tuticorin, Mr. K.V. 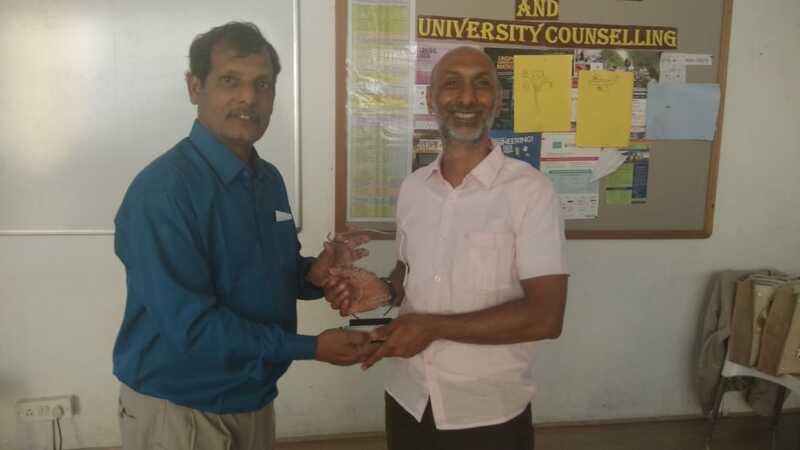 Muraleedharan, Good Shepherd International School, and Mr. Kuldeep Singh, Award Leader, Lawrence School, Lovedale. The event commenced with a welcome address by Mr. Bhalla, followed by an enchanting classical Bharatanatyam dance performance by the awardees of Lawrence School. The awardees welcomed the Chief Guest, post which the felicitation ceremony began. Participants from The Vikasa School, Tuticorin and the Laidlaw Memorial School and Junior College received 54 Bronze Awards; Good Shepherd International School and the Lawrence School, Lovedale were conferred with 39 Silver Awards, while 29 Participants from the Lawrence School received their Gold Awards. It was a moment of gratification for both the awardees and their schools alike. Following this, Ms.
Sue Walker addressed the gathering, after which Mr. Kapil Bhalla presented a memento to the Headmaster of the Lawrence School. The ceremony ended with lunch for the guests. 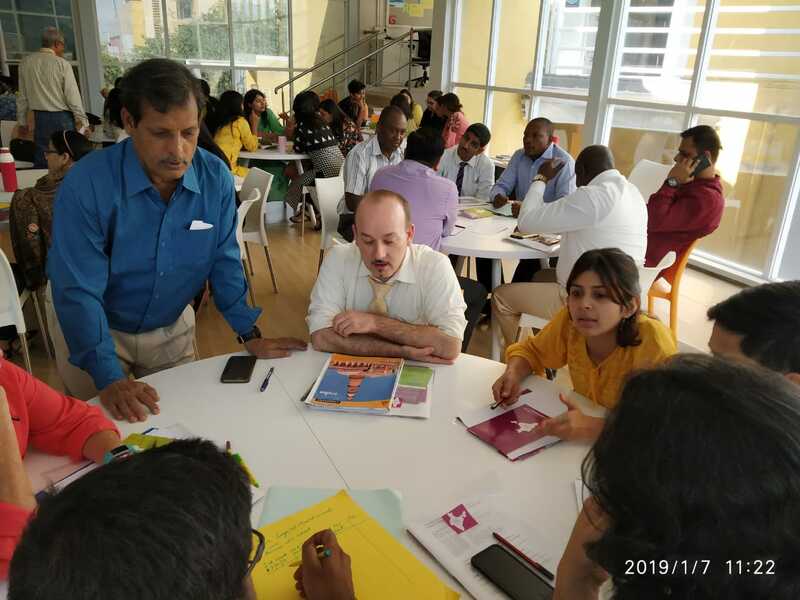 In its stride to provide opportunities for the youth as well as the growth of a community and to charge young minds with passion, student orientation workshops were conducted by Bivujit Mukhoty, the Programme Manager, at Global City International School, Bangalore, on 5th March 2019 and Indus International School, Bangalore on 6th March 2019. The objective was to interact with students, introduce the Award programme to the new participants and highlight its ideology and benefits. The orientations commenced with a Q&A session where students shared their view about their future goals. The Programme Manager explained how the Award Programme helps them to achieve their goals. This session was followed by an introduction to the Award Programme. The team threw light on the philosophy of the Award, its journey and its framework. They elaborated upon its various facets that include Voluntary Service, Skills, Physical Recreation, Adventurous Journey and Gold Residential Project for the Gold level of the Programme. The orientations concluded with discussions on the benefits of the Award Programme and its power to bring about a difference in the lives of young people. The orientation at Global City International School, Bangalore was attended by over 120 students, while the orientation at Indus International School, Bangalore was attended by over 110 students. IAYP India welcomed Sue Walker, Regional Director, Asia Pacific Region to India. During her visit, Sue met with Himmat Kalsia (Trustee Chairman, APF) and Dr Sanat Kaul (Managing Trustee, APF) in Delhi. Kapil Bhalla and Sue Walker also met with Ruchira Ghosh, Regional Director, South Asia, from global partner Cambridge Assessment International Education at Mumbai. Sue and Kapil also visited Global Pathways Matriculation Higher Secondary School (Coimbatore) with Duke of Edinburgh International Award Foundation World Fellows, Mike Steele & Stacey Coote from the Steele Family Foundation and discussed further possibilities to collaborate with IAYP India. On 8th, Sue Walker attended an Award Presentation Ceremony at the Lawrence School, Lovedale, Ooty and presented Awards to successful achievers. The Award participants of Sanjay Ghodawat International School, Kolhapur, visited the Narveli Caves and nearby villages for their Adventurous Journey section. Mr Sasi Krishnan, an Award Leader from SGI School, narrates the experience of the trip, highlighting insights that the participants gained, both about their surroundings as well as themselves. Sanjay Ghodavat International School aspires to nurture each child as a skilled personality. Here, we lay equal emphasis on academics and activities like field trips, trekking, bird-watching, nature walks and adventure camps. These outdoor activities are organized at regular intervals to provide the students with opportunities for experiential learning. As part of IAYP’s Adventurous Journey section, a camp was organized for two days and a night for Bronze participants, three days and two nights for Silver participants, and four days and three nights for Gold participants. 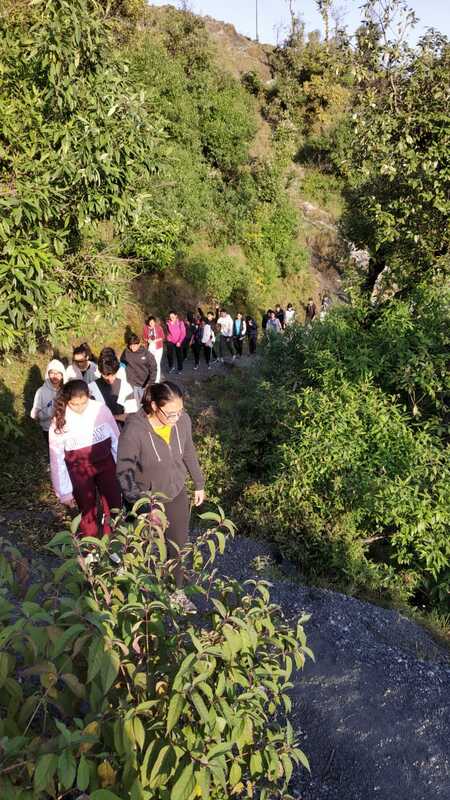 The participants, accompanied by nine members of the teaching staff and four attenders, journeyed to the Narveli caves and temple, a reserved forest area, Brobet village and Gaganbawda, around 85 km away from the school. The journey was operated by an adventure team ‘Kolhapur Hikers’, assisted by IAYP Award Leaders Mr Venkat and Mr Dushyanth. The participants were pumped up to commence the journey on 23rd November 2018. The team carried all the necessary items like rice, vegetables, flour, spices, utensils, lights, sound systems, etc. After reaching our planned destination at 11:30 in the morning, the participants cleaned the area and set up 27 tents. Having been divided into eleven groups, the participants, along with the staff, trekked towards the Narveli caves. 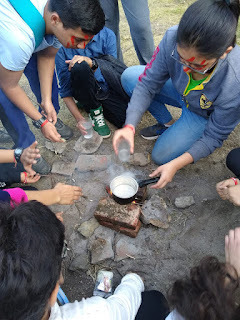 The trekking distance was about 8 kilometres up and down and we returned at 7:30 p.m. At around 9:00 p.m. we lit the bonfire, which was followed by playing games, singing songs, narrating stories and dancing. Our Director Principal was kind enough to join us on our Adventurous Journey on that day. 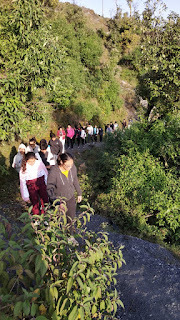 The next day commenced with the participants preparing for another trek. During the trek, the participants engaged in a multitude of activities like bird-watching, discovering rare plants, peacock feather collection, etc. Post lunch, games like the treasure hunt, essay writing and sketching were organized. The journey concluded at 4:00 p.m. and the Bronze Award participants prepared for their return, while the other participants stayed back. The Adventurous Journey section of the Award Programme is not just a platform for expanding the knowledge base of young adults; it’s an opportunity for participants to build human connections and develop their leadership abilities. Advaita Singh, an Award participant from Billabong High International School, Bhopal, narrates her experience of visiting Chandigarh, Manali and Delhi, highlighting how she made a new family in the process. Here is the thing about an adrenaline rush -- there is nothing like it; the racing pulse, the thudding heart, the shaking of the feet in anticipation and fear and the doubt that constantly knocks against your once logical mind. So, we can proudly proclaim that the journey that we undertook to Chandigarh, Manali and Delhi as part of IAYP’s Adventurous Journey section was unmatched in terms of experience. On 22nd December 2018, a bunch of exhilarated participants boarded the Bhopal Express to begin a journey that they would cherish forever. After hours of journeying through the plains and the hills, we arrived in Manali. With its snow-capped mountains, breathtaking landscape and starry skies, Manali had an air that made us push ourselves beyond our comfort zones. The temperature being sub-zero there, we realized the importance of sticking together, quite literally. Having travelled for long hours, we were exhausted on the first day. However, with renewed zeal, the next day we trekked up to Solang Valley where we participated in adventure sports like zip lining, snow-mobile ride, skiing and snow tube ride. We walked back home before nightfall where a comfortable bonfire evening awaited us. We spent the evening under the stars, singing songs, playing games and planning our rafting trip, scheduled for the next day. 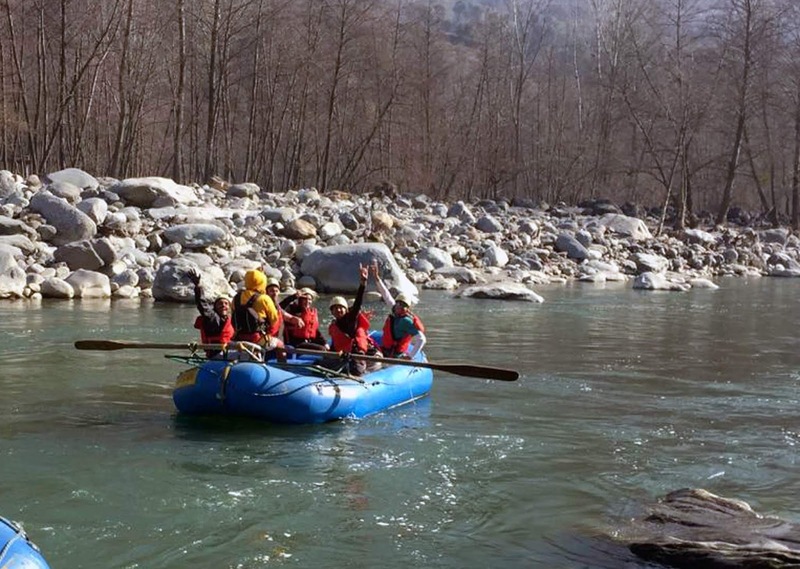 River Beas was our rafting point in Kullu. We cut through the chilly breeze as our rafts raced across the snow-fed stream, bumping over the river rapids, leaving us with an enthralling experience. Though our trip was amazing in its entirety, its highlights were activities like trekking, zip lining, rafting that challenged us to vanquish our fears. We not only developed as individuals but also learnt to move forward as a team. We have become more adaptable and receptive, learning to push our limits. The trip has brought us closer to our existing friends and offered us opportunities to make new ones. This week-long experience was one where we minted memories with people who had now become our family. Now that we have resumed living our normal lives and routines, we can say that the people who have returned are not the same anymore; they have undergone a complete transformation of their personalities and ideologies. The International Award for Young People would also like to congratulate the sixteen Outstanding Cambridge Learner Award Holders for their fantastic achievement in topping the various sections in their Cambridge Assessment while pursuing their Award Journey. Their achievements exhibit how the Award creates opportunities for the young person to develop skills, get physically active, volunteer within their local community and experience adventure outside the classroom, which inherently helps them in being more focused and aids them in achieving the higher educational standard in a holistic environment. Doing the Award is a personal challenge and it pushes young people to step outside their comfort zone and recognise their achievements. Through the Award, students become confident, responsible, reflective, innovative and engaged learners. The Award provides a young person with new insights into their capabilities and by trying new things helps grow confidence and develop useful skills. IAYP wishes the following young people all the very best in their Award Journeys, and in their journey of life ahead! Accomplishment is the product of constant struggle, backed by courage, focus and motivation. To celebrate the efforts of young adults who’ve participated in the Award Programme, IAYP presented certificates for Gold Level achievement and Silver level achievement to some of the participants from Cambridge curriculum schools at the ‘Outstanding Cambridge Learner Awards’ ceremony took place on 9th February 2019 in Mumbai. The occasion was graced by Ms Christine Ozden, the Chief Executive of Cambridge Assessment International Education, who was the Chief Guest at the ceremony. More than 90 Cambridge Awards were given while the Principals of more than 70 schools attended the ceremony. Having joined hands in creating committed young people, it was a proud moment for both IAYP and the various schools that had been given the Awards. Mr Kapil Bhalla, the National Director, IAYP, addressed the gathering and detailed the benefits to the students from the partnership of Cambridge Assessment and the Award programme. Gold Award participants from around the globe are welcome to apply for the two-weeks Solar Conservation Project at Spiti, Himachal Pradesh, organised by Ecosphere in collaboration with IAYP India. The project is one of its kind, combining an Adventurous Journey and Gold Residential Project exclusively for Gold Award participants. During this journey, the Award participants will be travelling through Spiti and will spend 5 days assisting the local community in the construction of a Greenhouse enabling a local farmer or a Monastery/Nunnery to have access to green vegetables throughout the year. You will participate in the actual construction of a greenhouse and will be assisted by a dedicated team comprising a qualified mason and trained person from Ecosphere. The activity will entail physical work and you will get hands-on learning of traditional mud building techniques – both mud blocks and rammed earth. One will also learn the basics of solar passive architecture and how best to insulate using readily available local material and the sun to heat up the structure. The trip is a mix of work and pleasure. During this trip participants will be visiting some of the highest villages in the world, going on a high-altitude trek, visiting some ancient monasteries dating back to over a 1000 years, and taking a yak/horse safari and mountain bike -- if interested. Traditional homestays further enrich the experience by giving one an authentic understanding of the life and culture in a Spitian home. Detailed information and application form can be obtained from here. The last date for registration is 30th April 2019. Serving others is a spiritual experience that instils calm in every human being. Rajyasri Rao, a Gold Award participant of The Lawrence School, Ooty visited Bokapuram village and Masinagudi as part of her Gold Residential Project. Defining her visit as a ‘life-changing experience’, she shares insights on what it means to serve others. “Before giving, the mind of the giver is happy; while giving, the mind of the giver is made peaceful; and having given, the mind of the giver is uplifted.” says, Buddha. We seemed to have seen this insightful quote come to life when, as part of IAYP’s Gold Residential Project, we visited Bokapuram village and Masinagudi. During our five-day visit that began on 27th September and concluded on 2nd October 2018, we became the embodiment of ‘work hard, play hard’. At the school we were residing in, we engaged in levelling the ground and painting a primary classroom with colours most appealing to children. In Bokapuram, we engaged in renovation work on the houses of two elderly women. Another facet of our project was spreading awareness about the consequences of alcohol addiction in a village adjacent to the school, as part of which we painted signs on walls and conducting awareness campaigns in the village. 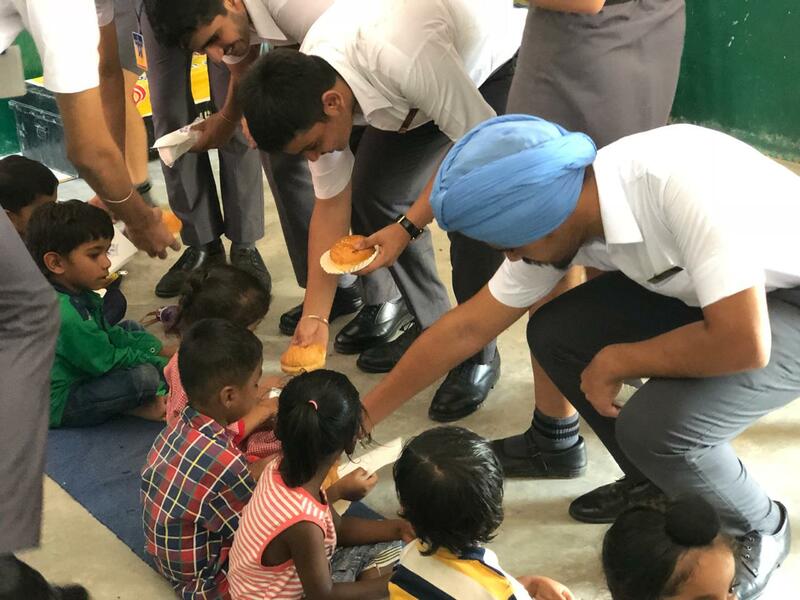 Putting up at a school with basic amenities, cleaning our own dishes and living spaces and contributing selflessly – all these instilled a sense of responsibility and consciousness in us. The contentment we derived after having finished our visit was supreme. The teachers who accompanied us guided us towards looking beyond the comforts of premiere boarding schools. They taught us to be humble and considerate by exposing us to an alien lifestyle departing several life lessons discussion sessions after dinner each night. 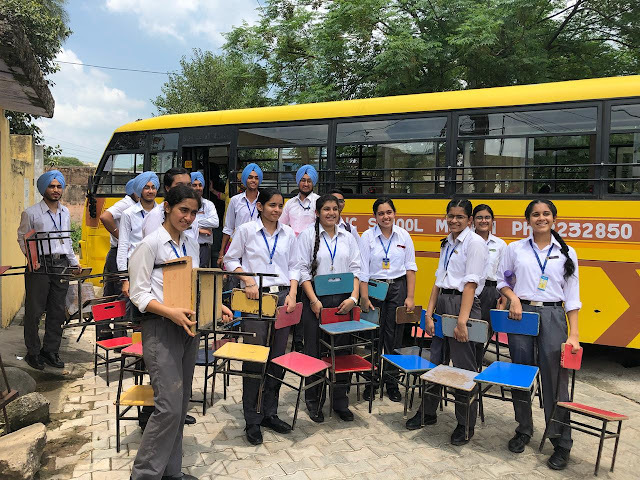 Our teacher incharge, Mr Kuldeep Singh and other teacher escorts Ms Kamaljeet, Mr Kartikeyan, Ms Anjali and Ms Samina were as much a part of this labour intensive project as we were. Their dedication towards the cause together with their guidance enlightened us on what true service meant. Our support staff’s contribution made our stay comfortable and we would never be thankful enough for it. 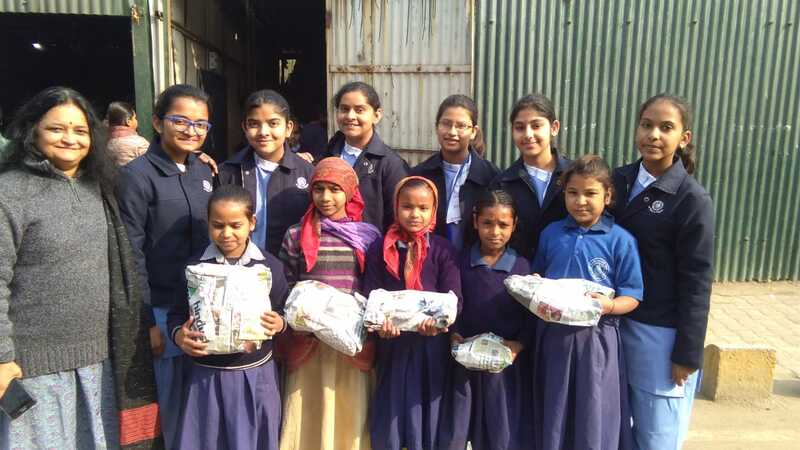 Ajay Singh, the Award Leader from Yadavindra Public School, Mohali, shares insights about eleven Award participants who visited a government school as a part of the Service section of the Award Programme. Mr Singh provides a new perspective on rural education. 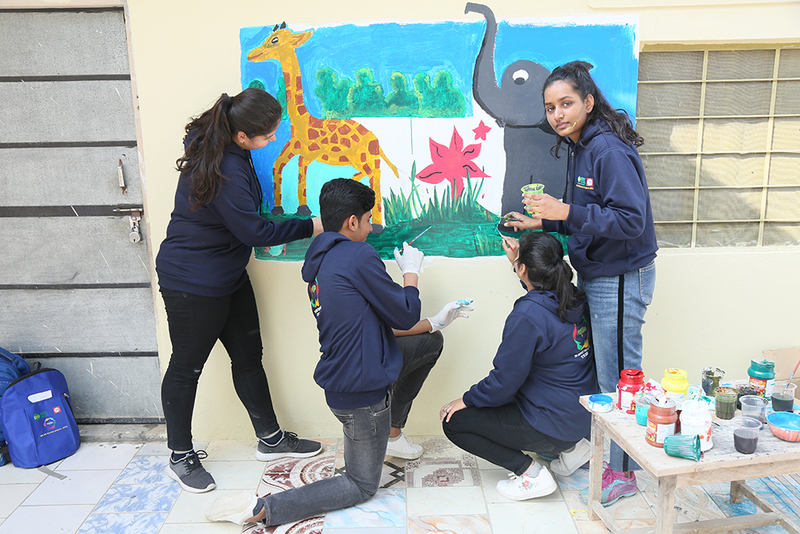 The Award Leaders of Yadavindra Public School, Mohali, staunchly believe in giving back to society and attempt to plant the same thought in the minds of the Award participants. 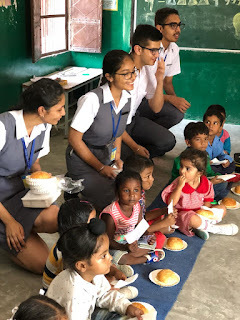 As a part of the Service section of the Award Programme, participants visit different orphanages and government schools time and again to gain insights about the lives of children there. 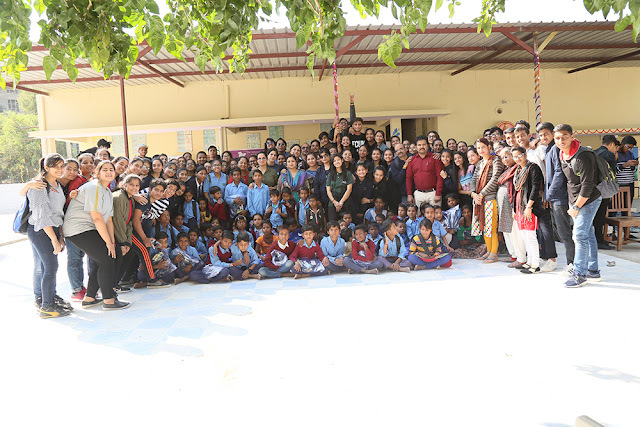 Aiming for the same, a group of eleven Award participants along with two Award Leaders visited a government school situated in a suburban area of the town. The government school that we visited had five classes, each with tables, chairs and a blackboard, at the least. There were six teachers and the students comprised children from rural areas and other backward areas surrounding the location. Though hesitant initially, many of them gradually expressed their delight when the Award participants interacted with them. The participants interviewed the teachers, who expressed their views on how a lot of parents of the students are not receptive to the idea of schooling. The teachers also highlighted their struggle of getting children, especially from poverty-stricken backgrounds, to study. As reported by them, some of the students did not even have any footwear when they first came to school and had to be bathed in the school itself on more than one occasion. The participants distributed snacks and sweets among the students and teachers and spent time playing games with them while also educating them about personal hygiene. The Award participants of Mody School, Lakshmangarh visited Bal Seva Sadan and worked with the school as part of the Residential Project of the Gold Level. Recounting their experience of engaging in a host of activities at the school, these participants redefine the power of lending a hand. Under the banner of IAYP, the Award participants of Mody School and seven other renowned schools of the country gathered to participate in a five-day Residential Project as a part of their Gold Award Programme. 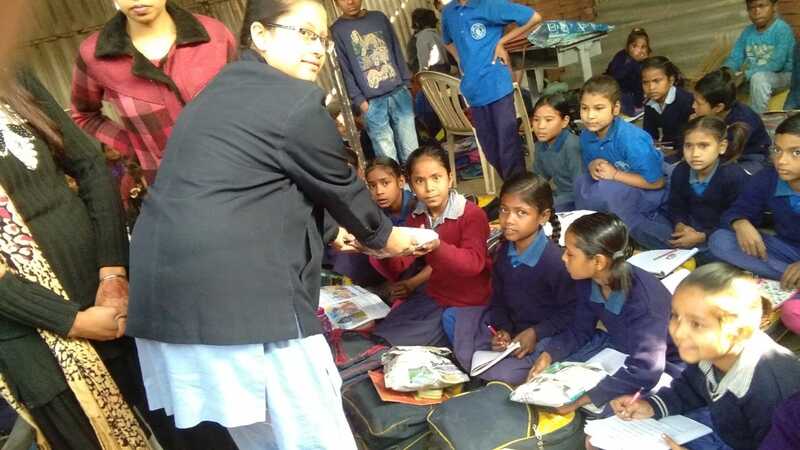 Mody School, Lakshmangarh has adopted a school, “Bal Seva Sadan”, through which it provides free education to underprivileged children of the area. Aligning with its aim to fulfil some material and service requirements of Bal Seva Sadan, Mody School sought to improve the basic infrastructure there for this Residential Project. 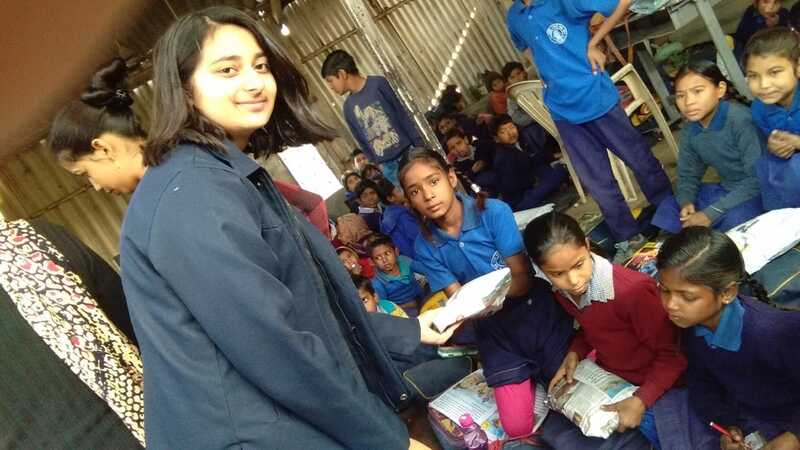 19 participants of Mody School aspiring for the Gold Award, 26 participants for the Silver and Bronze Awards along with 60 others from visiting schools, actively participated in this project. They raised substantial funds to meet the expenses of the project. Ms Nishi Rana, the Principal of Mody School inaugurated the project by planting a sapling, marking a new beginning. In the same spirit, all the participants and teachers also did the same. Following this, the participants, together with the students of Bal Seva Sadan, were divided into 8 groups. The groups cleaned the ground and prepared a cemented path. They even distempered the wall, preparing them for further work. On the second day, a water cooler with RO was installed, the existing tin shed was extended by fixing another one and a learning session comprising dance, poetry, painting and drama was conducted by all the groups for the students of Bal Seva Sadan. The students also began tiling the floor with vitrified tiles. The third day saw the volunteers painting the walls and marking the sports ground. The groups first sketched on the walls and then painted them with myriad colours. Two groups engaged in marking the badminton court and a grid for stapu. The learning sessions, too, continued with great conviction. On the fourth day, the groups finished the wall paintings and fixed baskets on the walls for practising basketball. The students were provided with sports equipment for playing badminton, basketball, karate and gymnastics. 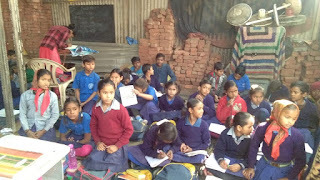 On the fifth and final day, a counselling session for the students of Bal Seva Sadan was conducted where they were taught the importance of education and the benefits of attending school regularly. The most awaited moment for the participants as well as the younger students was their final performances. The groups performed whatever they had learnt during their sessions and felt elated on being able to perform well. They were given school bags, water bottles and sweatshirts, among other things. 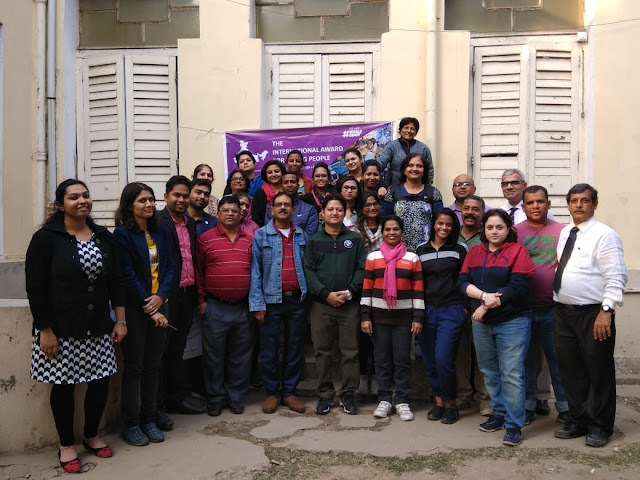 On January 17 and 18, 2019, the National Award Authority organised an Award Leader Training (YES) Workshop at the Emmanuel Ministries Calcutta, Kolkata. The workshop was led by Kapil Bhalla - National Director, Bivujit Mukhoty - Programme Manager and Bhagyasree Sengupta - Programme Assistant. The objective of the workshop was to interact with the Award Leaders of different schools and iterate the importance of their contribution in the journey of the Award participants. The workshop witnessed a total of 27 participants. The organisations that participated in the workshop were Modern High School For Girls, Kolkata; Sri Sri Academy, Kolkata; Father Leblond School, Madati; B.D.M International, Kolkata; Delhi Public School Newtown, Kolkata; The Heritage School, Kolkata; South Point High School, Kolkata; Mahadevi Birla World Academy, Kolkata; Indus Valley World School, Kolkata; Delhi Public School Megacity, Kolkata, Sacred Heart School, Siliguri; Emmanuel Ministries Calcutta, Kolkata; BIGFOOT, Kolkata and Juniper Wings, Kolkata. The workshop commenced with an ice-breaking session followed by an introduction to the Award Programme. The team threw light on the philosophy of the Award, its journey and its framework. They then went on to explain its various facets that include Voluntary Service, Skills, Physical Recreation, and Adventurous Journey. They also elaborated upon risk management, stressed the benefits of the Programme and touched upon the Residential Project for the Gold Level of the Programme. What followed next was a review session and discussion about the levels of the Award Programme. The session concluded with a film highlighting the Award’s achievements and its impact. National Award Authority wish to deliver their thanks to Mrs Premila Pavamani (President), Mr Shajan George (Executive Director), Mr Timothi Barrato (Award Leader) and Ms Bulbul Dutt (Award Leader) of Emmanuel Ministries Calcutta for their support and hospitality to organise this workshop. For pictures click here. This report has been submitted by Young Jun Yoo, a Silver Award participant who shares his experience of working at Mata Bhagwanti Chadha Niketan, a school for the differently abled. Narrating what he gained during the journey, he highlights how his perspective towards disability has changed. 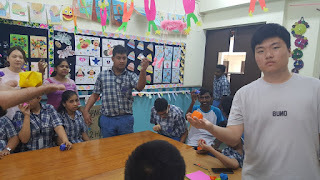 Working for 6 months with the students of Mata Bhagwanti Chadha Niketan, a charitable school for physically disabled children, as part of pursuing the Silver level of the Award Programme, provided me with the opportunity to serve the needy. That’s how my relationship with the students of MBCN commenced. I distinctly remember the very first day I met the Vice-Principal, Mrs Sheeba, to whom I nervously explained my plans of conducting an interactive session with the students of MBCN. My first class, the students of which comprised those with hearing impairment, started just a week after meeting with Mrs Sheeba, for which I prepared a printout of different insects, such as butterflies and dragonflies. Initially, I faced difficulties in communication due to lack of knowledge of sign language. Thus, I used my body language to communicate with them. During the course of my interaction with the students, I learnt how a smile was the key to communicating with people. 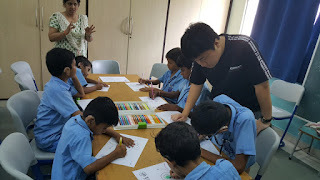 After the first interaction itself, the students started decorating the printouts on their own, displaying their fine talent in drawing and craft work. They broke down my prejudiced ideas about disability and I saw my perceptions changing. Post the first class, I became more familiar with the students, which eventually led to a proper timetable being formulated for my interaction with them. Earlier, I took classes only with students who had a hearing disability, but from then onward, I could meet every student of MBCN. These students, though differently abled, were bright young people with warm hearts. From colouring an insect to making an animal bus, I prepared a number of innovative activities for the students. Only recently, I gifted them socks with character paintings, which they really admired. It feels great to have brought smiles to their innocent faces. 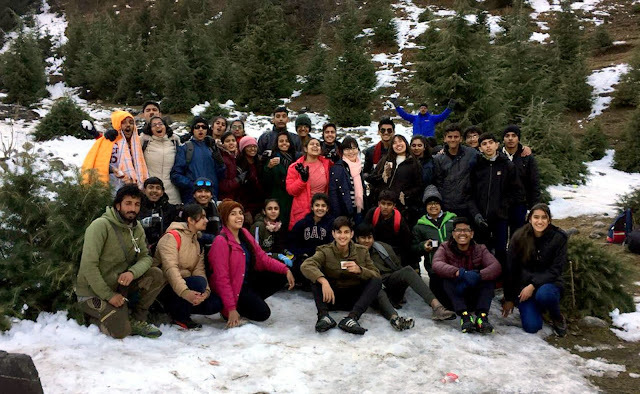 The following report has been submitted by Manasi Pathak, an Award participant from Delhi Public School, Gurugram, who shares her experience of visiting Mountain Quail, Mussoorie as part of her Adventurous Journey. Highlighting IAYP’s role in her experience, she narrates how this visit has been an eye-opening experience for her. Nature keeps us grounded, obstacles make us perseverant and adventure makes us tough. We could reflect on these words when we began our journey to Mountain Quail, Mussoorie. Organised from October 10 to 13, 2018, Camp Anubhav offered us myriad activities to undertake. As campers bubbling with energy and excitement, we reached our school by four in the morning and left the school premises by quarter to five. On reaching Mussoorie, we were divided into two groups, namely the Red Rangers and the Blue Battalions, with two guides for each group. Having played amazing games like ‘where’s my monkey?’ passing the parcel, air hockey, and ‘straw and bangle’, we concluded our first day by writing our activities for the day in a journal. The second day commenced with heavy rain and we were kept busy with interesting indoor activities. Once the rain ceased, the two groups engaged in Burma bridge crossing and raft building. Post lunch, the Red Rangers went stream running while the Blue Battalions went rock climbing and rappelling. Following this was a steep trek. On the third and last day we played an interesting game, the Guerrilla War. This game was worth eight hundred points and was a game changer for both the teams. The last day concluded with Red Rangers being adjudged the best group and a vote of thanks by the members of Camp Anubhav. Towards the evening there was a DJ session for all the campers, after which we sat around a bonfire telling ghost stories. For me, the most soothing time of the entire camp was the journal writing time when we could quietly pen down our thoughts for each day. We learnt a lot during this camp, such as helping each other and not belittling other’s fears. The Award Programme has truly been a life changing experience for us as we got to enhance our skills and expand our horizons. While games like Guerilla Warfare have inculcated teamwork and sportsmanship in us, thrilling adventure sports like stream running have made us more patient and have enhanced our decision-making skills as we played this game of faith with rocks, deciding which ones would not make our trip. We’ve gained patience and fearlessness. The trip would have been unaccomplished without the presence and support of our teachers. The absolutely mesmerizing experience at the camp has given us innumerable memories to think of and cherish for a lifetime. The International Award for Young People, India encourages young people to develop the character, skills and confidence they need to improve themselves and their communities, by encouraging them to step outside their comfort zone and build positive habits that they will take with them for the rest of their lives. With the support of adult mentors, the Award helps young people to unleash their passions and believe in the power of their own potential. Keeping the above aspects in view, a training workshop for Award Leaders was conducted on December 7, 2019. 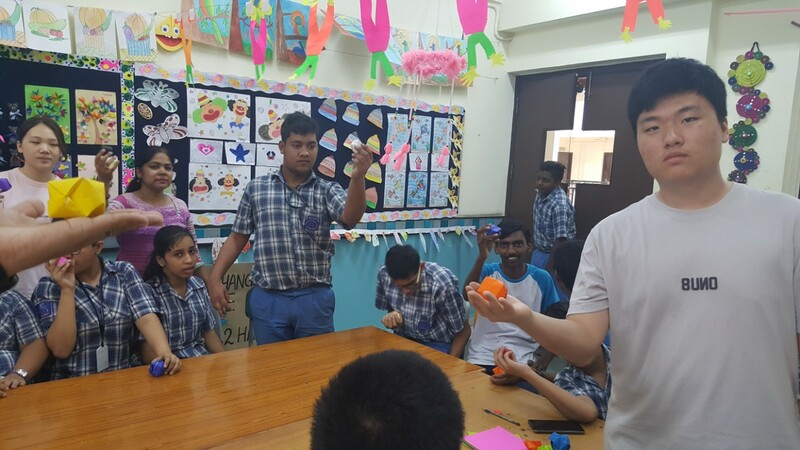 Kapil Bhalla (National Director) and Bivujit Mukhoti (Programme Manager) facilitated the workshop with 49 participants from Singapore International School, Mumbai; Ram Ratna International School, Thane, and Adventure Education Tours (Mumbai) Pvt. Ltd., Mumbai. The workshop gave an introduction to the Award and its philosophy, and the four pillars: Service, Skills, Physical Recreation, Adventurous Journey and the Residential Project for Gold level. Under each session, the Award Leaders under training performed a few activities that made use of their imagination, skill and initiative. The National Award Authority wish to thank Mr. Riad Rojoa (Principal) and Mrs Sharonee Mullick (Director) Singapore International School, Mumbai for their hospitality and support. More workshop pictures can be seen here. This report has been submitted by Ms Sukhbir Kaur, Award Leader, Bawa Lalvani Public School, Kapurthala, who shares the experience of the Adventurous Journey of 159 participants of the Award Programme from Bawa Lalwani Public School. Ms Kaur had much to narrate on the participants’ visit to Camp Comrade M/s. Rocksport. In our interconnected and wired world, the youth is increasingly tethered to their digital devices, working constantly to maintain their digital profiles. As ‘social’ as these exercises may seem, they are, in fact, becoming a way to isolate oneself and stunt social interactivity rather than being a tool to enhance it. 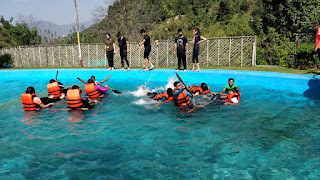 An adventure camp with a meaningful purpose and a set goal was the finest idea which was planned for the respite of the participants and to bring about a change in their outlook of the world. The park where the participants camped was built scientifically, with barriers and hurdles for engaging in fitness outdoors. It is a deliberately built ‘obstacle assault course’ designed to test every aspect of one’s senses ranging from balance and grip strength to climbing, running and crawling. Only the tenacious ones could complete the full loop in one go. Spanned over a period of four days, the participants basked in their new found independence away from home and beyond regular text books. They learnt about tent-pitching and different kinds of camping gears along with learning to tie essential knots. Other activities in which students took part were caving, rock-climbing and rappelling and the participants were made to trek to the locations where these activities were organised. These activities were quite arduous under the scorching sun but they allowed the participants to step outside their comfort zones and challenge themselves. The participants also gained thrilling experiences of different adventurous activities like Burma bridge crossing, bamboo bridge crossing, commando bridge walk, bushcraft, zip-line, jumaring, rope valley crossing, night trekking and camp fire. Every activity tried the strength and flexibility of the participants and taught them to sustain themselves in the toughest conditions whilst improving their endurance levels.